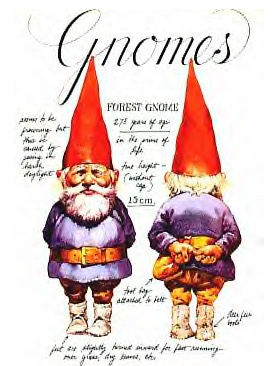 Before Gnomes became a bestseller in the US, I read it in the original Dutch, titled Kabouters. In both languages, the text is witty and so straightforward that you're almost ready to believe gnomes actually do exist  but it's Rien Poortvliet's painstakingly realistic illustrations that make the book an utter delight. In Holland, Poortvliet's done much more than this one title. He's even got his own museum! You can read more about him here  but that link will take you to a Wikipedia entry, so be warned that the information it offers may not be 100% accurate. In ieder geval, veel plezier daarmee!